Don’t cry cos VAMFF is almost over, Listers, smile because it happened. And smile—no wait, grin like a Cheshire cat—over the thought of all the new season fashion because, judging by the looks we saw strut down the catwalk, your credit cards are going to get a serious workout! If you’re looking for the hottest fashion trends for winter, look no further than our VAMFF runway report. Who are we kidding, did black ever go anywhere?! This season, Scanlan Theodore has reinvented how we’ll be wearing black, with a pair of cropped black pants and fluffy black sweater winning us over at the Miss Vogue show. Swoon! We know, we know…white in winter?! You’d better believe it, Listers, because winter whites are one of the hottest fashion trends coming from VAMFF. We’re dying to get our mitts on this Dion Lee dress and plan on wearing it morning, noon and night. If Little Red Riding Hood were to be sitting front row at frankie magazine’s VAMFF show, she would’ve gone crazy for this búl cape. The perfect finishing touch for all your winter outfits, this caped crusader will work a treat over shift dresses for work, or worn with jeans come the weekend. You know, sometimes all a girl wants to wear is a comfy sweater, an easy skirt and some cool flats. Clearly búl does too; after all, they sent this moody blue combo down the runway! By changing up the fabrics—knit sweater with a cool leather skirt—búl has turned easy dressing into one of the most covetable fashion trends for winter. Hot damn, Listers—a white shirt and black skirt never looked so good! 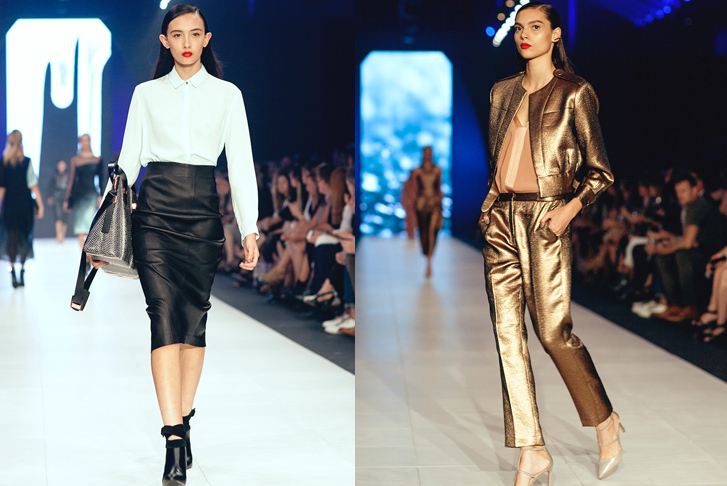 Secretary Chic is one of our favourite fashion trends to come out of VAMFF, with Ginger & Smart nailing the look. Take it up a notch by adding a blood red lip. There’s nothing like a power suit, and this winter, which know exactly which one we want! Presenting Bianca Spender's metallic combo—the ultimate in power dressing and one of winter’s most desirable outfits. Worn separately or together, this is one fashion trend you need now! Classy, classy, classy! That was the overall vibe coming from Martin Grant during the Harper’s BAZAAR parade, in particular from this feminine outfit. 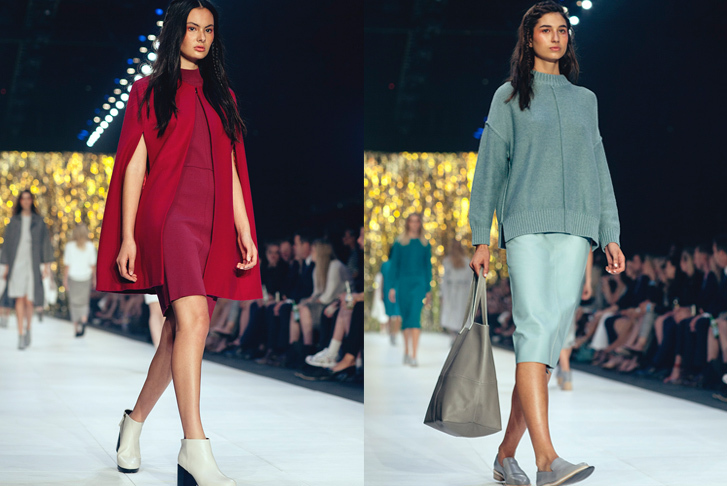 One of our fave fashion trends from VAMFF, ladylike chic doesn’t necessarily mean florals; instead tried colour blocking for a more modern take. Our second last pick of the hottest fashion trends from VAMFF was this sporty outfit from Rachael Zheng. Athletic shapes, teamed with block colours and innovative fabrications, makes for an outfit that we want baaaad! And that tie around the waist? The perfect sporty finishing touch. Pick your team, Listers, cos it’s on this winter! After seeing this sculptural Lauren Acciarito creation in the National Graduate Showcase, we found ourselves craving gelato—seriously, the pastel shades were almost good enough to eat! Pastels, sorbets and gelati tones will be all the rage this winter, just you watch!